Offering support across multiple channels is becoming more popular than ever as companies seek new ways to improve customer experience. According to the Aberdeen Group, companies doubled the number of channels they use to interact with customers between 2012 and 2017. But providing support on a few channels and delivering a truly integrated omnichannel solution are two different things. 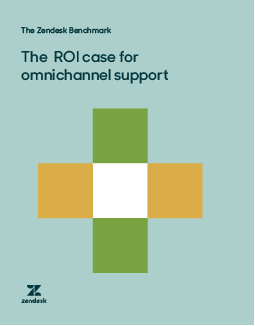 With data from the Zendesk Benchmark, our index of product usage data from more than 45,000 Zendesk customers in 140 countries, we examined why companies are going omnichannel and what sets the companies using Zendesk for omnichannel support apart from everyone else. Ultimately, we discovered a tangible ROI in terms of improved efficiency and an all-around better support experience for customers. Our findings should be a wake-up call: Become an omnichannel company or risk getting left behind. Among Zendesk Benchmark companies, those using an integrated omnichannel solution outperform those who stick to a limited number of channels or operate channels in silos. Their customers spend less time waiting for responses, resolve their issues faster, and are less likely to require follow-ups. Customers want to move seamlessly across channels. Since 2017, a majority of customers with multiple tickets used more than one channel. For integrated omnichannel companies, live channels are on track to surpass email and webform in terms of the share of a support team’s workload they represent. Tickets handled through phone and chat support see higher CSAT, fewer re-opens, and faster first resolution times. They’re more likely to take an omnichannel approach, as B2C companies represent the largest share of integrated omnichannel companies by target audience. Please complete the form below. In addition to providing the white paper download, this also gives you access to our free weekly newsletter and the opportunity to receive invites to our world-class events and webinars. By downloading this whitepaper, your registration details will be shared with the sponsor who may contact you about their respective products or services. We will not otherwise disclose your personal data to anyone else unless we have your permission as detailed in our terms and conditions (www.ebm.media/terms-conditions/).